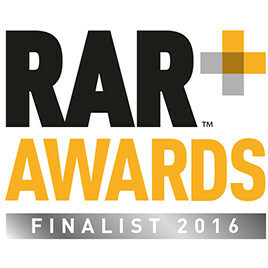 After a host of glowing recommendations from our clients led to us being listed on the RAR (Recommended Agency Register) earlier this year, we are now absolutely over the moon to announce that we have now been announced as a finalist for the RAR Awards 2016! We have been nominated for the “Events, Combined” category and join some of the most successful event and marketing agencies in the country. The good people at RAR spent weeks combing through thousands of client ratings to come up with the 2016 finalists and we are absolutely ecstatic to be nominated. The nomination comes from client recommendations making the news that extra bit more special as it means that only the finest agencies make it through based on the quality of their work and the relationships built up with their clients. The event itself takes place at the Marriott Hotel Grosvenor Square, London on April 28th and it promises to be a memorable night for everybody involved with the whole team looking forward to heading down to the big smoke.